To examine associations between hypertensive pregnancy disorders and maternal cardiovascular disease (CVD) in later life. We examined the associations between blood pressure (BP) in pregnancy, gestational hypertension (GH) and preeclampsia (PE) with cardiovascular measurements 6 years after index pregnancy among 4912 women participating in the Generation R Study, the Netherlands. BP, left ventricular mass (LV mass), aortic root diameter (AOD), left atrial diameter, fractional shortening, and carotid-femoral pulse wave velocity (PWV). Early pregnancy systolic and diastolic BP were associated with more adverse maternal cardiovascular measurements and a higher incidence of chronic hypertension 6 years after pregnancy. GH was associated with a higher BP, a higher PWV, a larger AOD and an increased LV mass 6 years after index pregnancy. Compared to previous normotensive pregnancies these women had a sixfold increased risk to develop chronic hypertension after pregnancy (OR 6.6, 95% CI 4.6–9.5). Compared to women with a normotensive pregnancy, women with PE had a higher BP and a higher risk of chronic hypertension (OR 4.5, 95% CI 2.6–7.8) at follow-up. After adjustment for BMI at follow-up in all the analyses on GH, PE and cardiovascular measurements, effect estimates attenuated up to 65%, but remained significant. 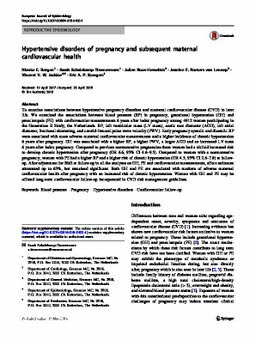 Both GH and PE are associated with markers of adverse maternal cardiovascular health after pregnancy with an increased risk of chronic hypertension. Women with GH and PE may be offered long-term cardiovascular follow-up incorporated in CVD risk management guidelines.